The new version of the Intel Solid-State Drive Toolbox (Intel SSD Toolbox) contains a new firmware update for the Intel Solid-State Drive Pro 2500 and 535 Series and the Intel Solid-State Drive DC S3710, DC S3610, DC S3510, DC S3500 M.2 and DC S3500 HD Series products. Optimize the performance of an Intel SSD in RAID 0 using Trim functionality Intel Rapid Storage Technology (Intel RST) 11.0 or greater. View your system information and hardware configuration, such as central processing unit (CPU), chipset, controller name, and driver versions. 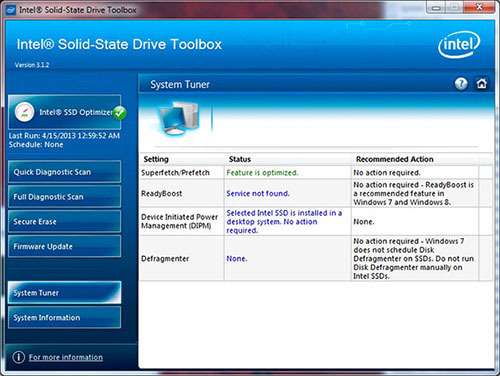 For non-Windows users requiring firmware updates, please visit the Intel Solid-State Drive Firmware Update Tool. Before beginning the Intel SSD Toolbox installation, review the Release Notes and follow the instructions in the Installation Guide. A Frequently Asked Questions document is also available for your reference. If you need assistance with the installation or experience issues, contact Intel Customer Support.